prior to planting or installing the fish in the fish tanks. and the fish were installed in the fish tanks. If video is not visible, please UNBLOCK your browser to allow YouTube to play. View a 2-minute video clip of the interior of 16 x 33′ Portable Farms® Aquaponics Systems – This small 16 x 33′ Portable Farms® Aquaponics Systems (in above video) feeds ten people the table vegetables and protein (tilapia) the food they need for optimal health – forever in 528 sq ft total space and 264 square ft grow space. This YouTube video has been viewed more than 65,800 times. 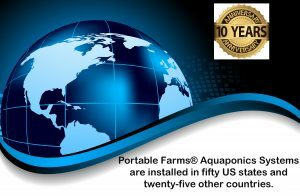 One acre of land can accommodate 120 Portable Farms® Aquaponics Systems. These modules are installed in four separate greenhouses housing 30 modules each. Each module is 5′ wide and 40′ feet long with 200′ of grow table space. These 120 modules grow 320,000 vegetables and 92,000 pounds of fish. This food will feed 960 people which is enough food for them to remain healthy FOREVER. Plus, it only takes 12 people to operate a full acre. Note: Aquaponics does not grow wheat, corn, rice, rye, soy or most beans but it does grow most lettuces and table greens such as kale, Swiss chard, bok choi and several blooming plants such as tomatoes, peppers, peas, green beans, cucumbers and peas, and of course, fresh-water-warm-water fish (tilapia or catfish). We make it easy for you to own a Portable Farms® Aquaponics System. * To find out what is IN the Portable Farms® Kit and what is NOT in the Portable Farms® Kit , please request the FREE AND INSTANTANEOUS PRICE LIST (second box on top panel on every page of this website). * Shipping and postage are included to addresses in the US only, BUT for all order outside the US there is a US$140 shipping and handling charge. * You may pay with PayPal, Major Credit Cards and Wire Transfers. * If you prefer, you may call us to give us your credit number over the phone: 800-906-0256 OR 800-952-6224. We also accept checks, wire transfers and money orders. * Most students complete our online aquaponics’ course in about twelve hours. * Our aquaponics course is online and self-paced. You have one year to complete the course. 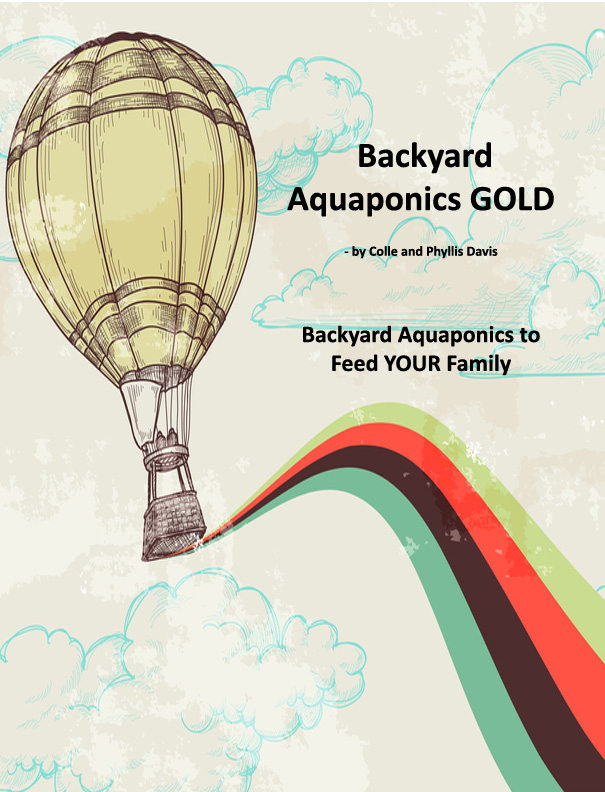 Many families install a backyard aquaponics system over a weekend assuming they have some basic skills for home repair and have access to repair tools. for growing food year round. It also uses 95% less water. 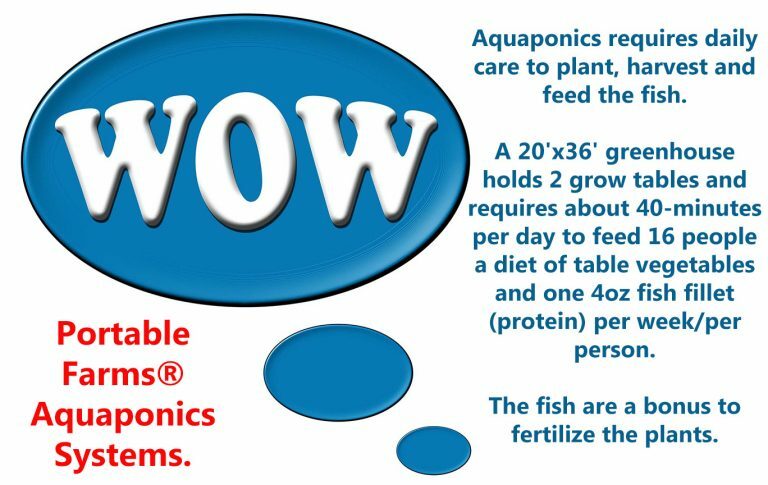 and less labor than any other aquaponics system in the world. 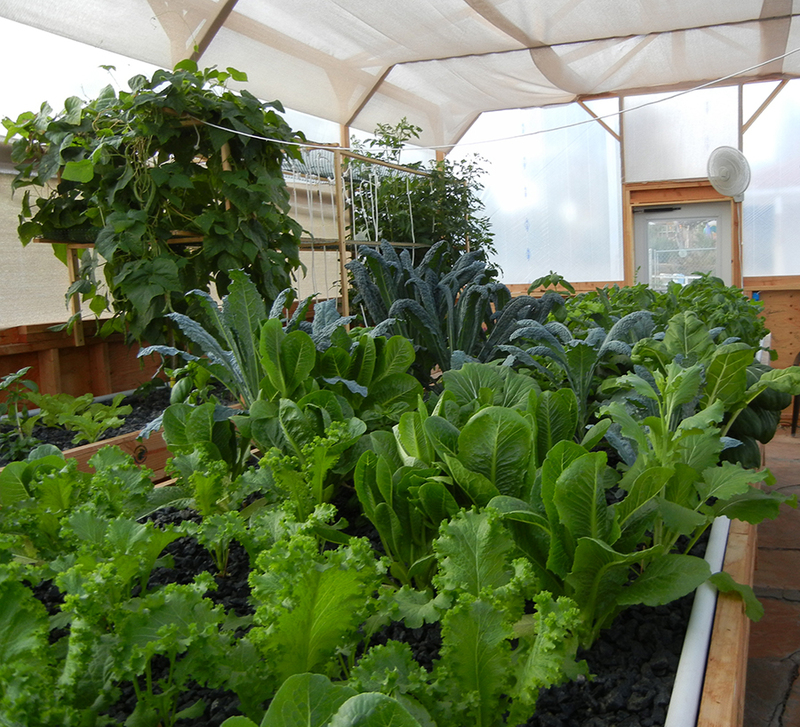 See our images of food commonly grown in a Portable Farms® Aquaponics Systems. Portable Farms® grow most green table vegetables and tank-raised fish, primarily tilapia fish. 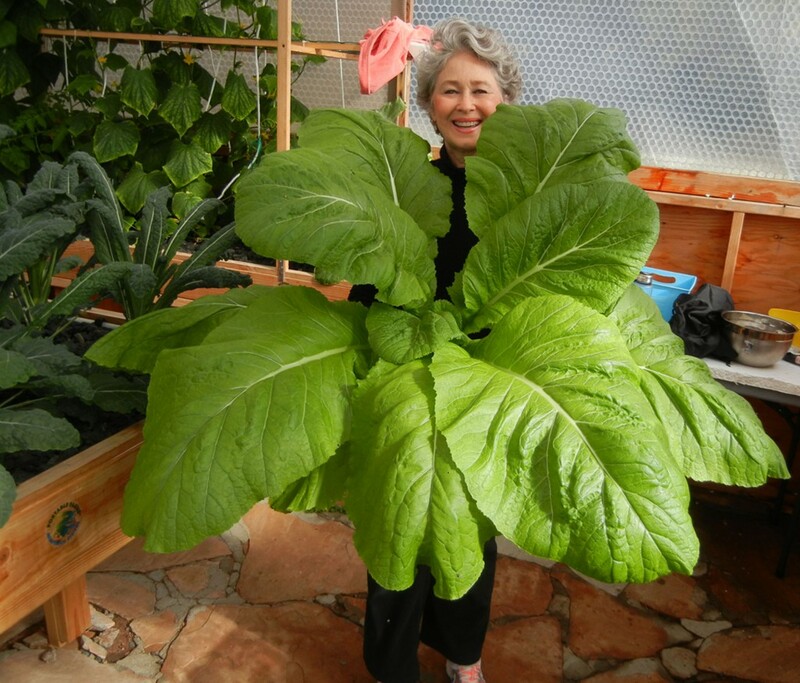 (image left) Phyllis Davis holding eight heads of kale with 47″ stalks. We also grow blooming plants such as tomatoes, cucumbers and peppers year round in warm greenhouses with additional grow lights. 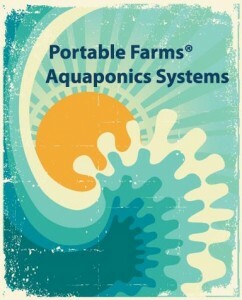 Portable Farms® Aquaponics Systems Course© – CLICK HERE. Inventors, Portable Farms® Aquaponics Systems. 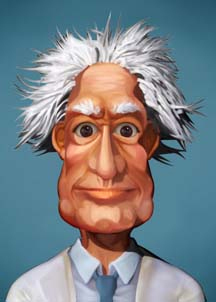 CLICK ON THE CRAZY PROFESSOR to learn more about Commercial Aquaponics. 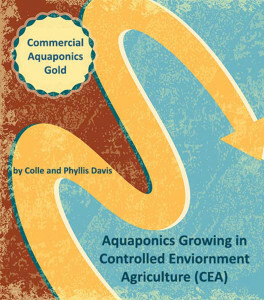 Listen to Phyllis Davis tell you about AQUAPONICS GOLD: CLICK HERE. Learn How to Raise Healthy Fish and Vegetables in Aquaponics. We reveal 17 Trade Secrets. 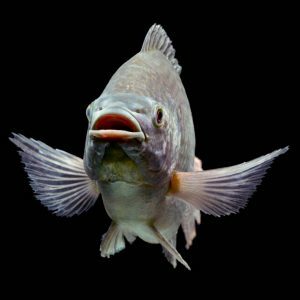 An overview for those considering the option of installing an aquaponics system near their home. 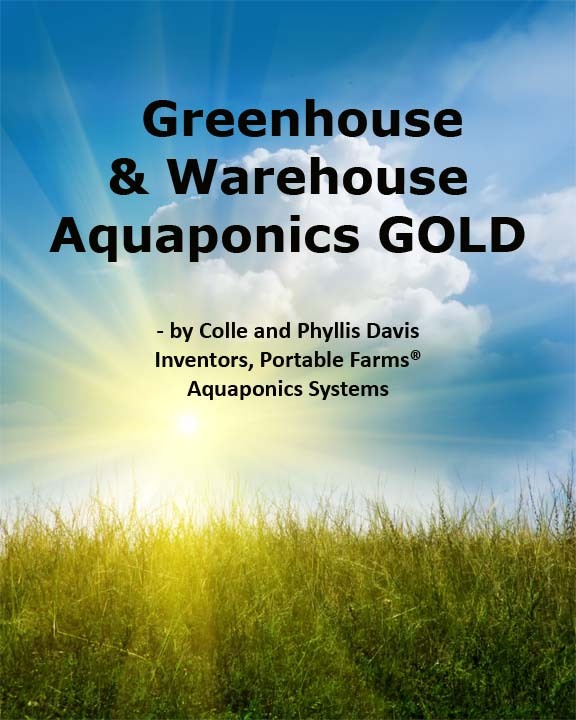 This ebook discloses the facts, figures and formulas necessary for successful greenhouse and warehouse aquaponics growing. Let us show you HOW, WHY, WHAT, WHERE and HOW MUCH it costs to install your own solar powered system for YOUR aquaponics system. Aquaponics’ Grow Tables raise healthy, fresh table vegetables. Portable Farms® Grow Tables never overflow and are now fully automatic. (second box on top panel on every page of this website). Most students complete our online aquaponics’ course in about twelve hours. 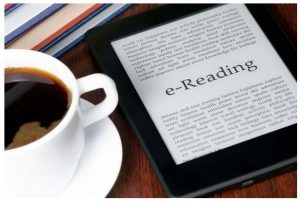 It’s self-paced and you have one year to complete the course. Many families install a backyard aquaponics system over a weekend assuming they have some basic skills for home repair and have access to repair tools. 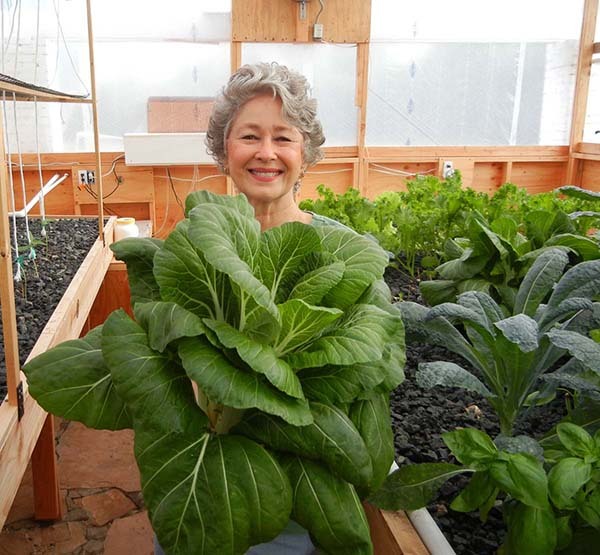 One module of a Portable Farms Aquaponics System can be sized to feed two people (5’x10′) to eight people (6’x32′). This translates as 25 square feet per adult. Interior of a 16 x 33′ Portable Farms® Aquaponics Systems. 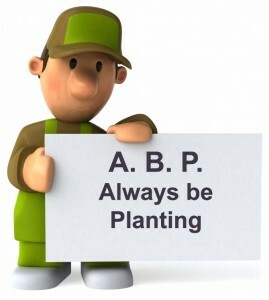 ALWAYS BE PLANTING. Every time you harvest a plant from your grow table, plant a new one in it’s place. Plant, harvest, plant harvest, repeat. PRAY FOR POOP. The fish poop is the precious nutrient stream that delivers the plants their food to grow tall, healthy and green. If your fish are happy, you’ll grow beautiful food. We even sing to our fish when we feed them and they love it. They begin to frenzy when they hear our voices. In fact, they’ll eat fish food out of our hand. They also enjoy consistent water temperatures of 78 degrees F.
GOOD DAY SUNSHINE. Your plants need a minimum of six hours of direct sunlight. In winter months, we use grow lights to extend the available sunlight for an additional four hours per day. NO SMOKING AND NO SMOKERS IN THE GREENHOUSE. All forms of tobacco, smoke, vaping or nicotine will cause Tobacco Mosaic Virus, Cucumber Mosaic Virus and other blooming plant viruses. BUGS BE GONE. Since you cannot use pesticides in your aquaponics system (they’ll kill the fish), it’s important to make sure no insects of any kind (including ants) come into the greenhouse. WEAR GLOVES when you’re working in the greenhouse. This protects your plants and fish from your germs, pathogens, hand lotion, perfume, etc. 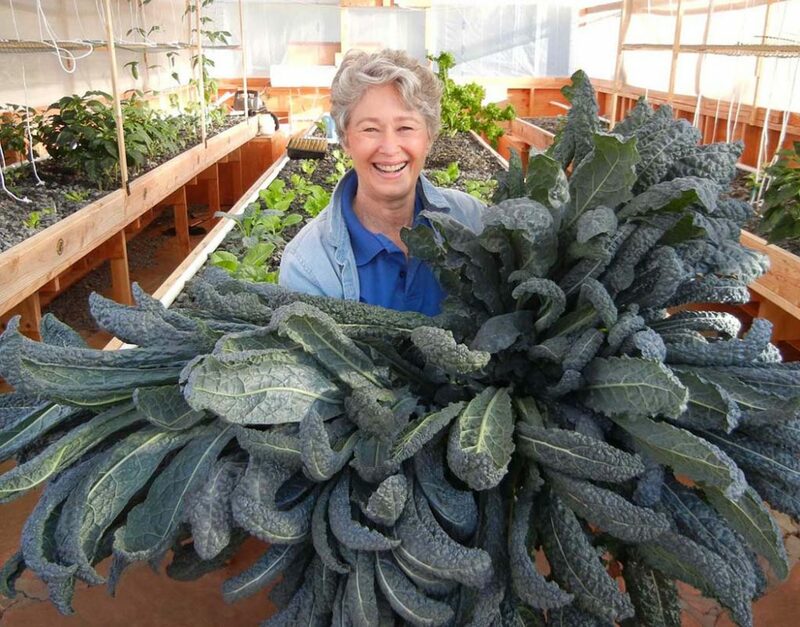 Phyllis Davis, co-inventor of Poratable Farms® Aquaponics Sytems, holding eight heads of kale Each kale stalk ranges in length from 40″ to 47″. This kale was grown in 45 days. One head of India Mustard, a very mild Asian green used as lettuce. Grown in a Portable Farms® Aquaponics System in 42 days. Sixteen heads of basil Portable Farms® Aquaponics System in 44 day. Each stalk of this basil averages 37″. 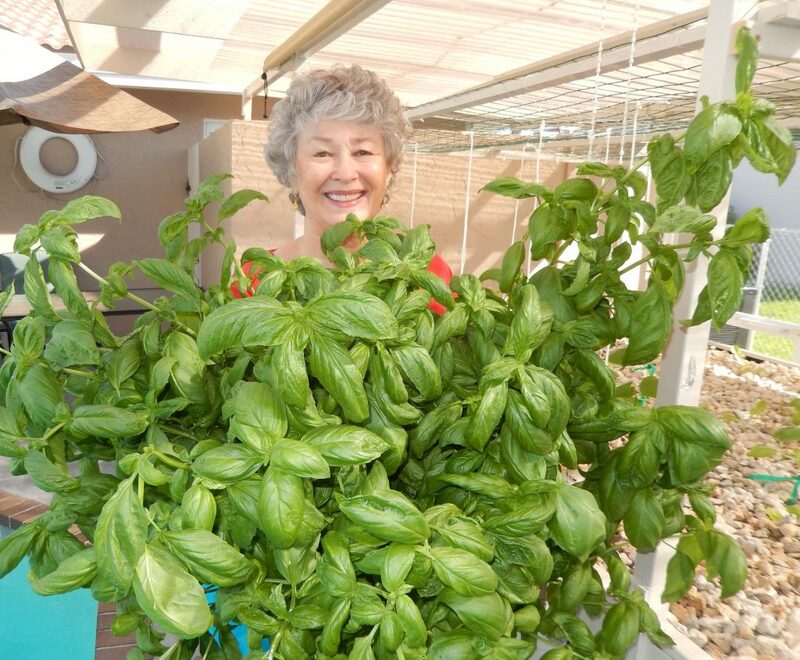 Phyllis Davis was awarded Second Prize after presenting Portable Farms® Aquaponics Systems to the San Diego Inventors Forum’s Annual Inventors Contest. View 8-minute presentation on YouTube video above (viewed more than 30,500 times). All of their food (nutrients) arrives twice per day of a warm fish effluent (heavy waste was removed). Nutrient-rich 80 degree F. water is refreshed and oxygenated a couple of times a day. The light levels are always perfect. The air circulates to reduce the humidity in the greenhouse. The temperature is pleasant and varies a bit so as not to be monotonous to the plants. There are no bugs or weeds or poisons in the farms. Since the plants have ideal growing conditions, they grow faster than the seed packets say they will. The plants require 90 to 95% less water than their dirt-bound relatives. I live in Pensacola Florida and plan to retire soon. Starting a small commercial aquaponic system seems to be something I’d like doing during my retirement years. How much land and investment capital do I need to clear $100,000 Annually? Also, Tilapia isn’t allowed in the panhandle section of Florida for some reason unless you can get a special permit from the state and I’m sure that won’t be easy. Therefore what fish type should I use for my area. Thank you for your time and looking forward to seeing what you folks can offer. Second item first, check with Florida Fish and Wildlife. You do not need a permit for blue tilapia in Florida, the hybrid you will need a permit. 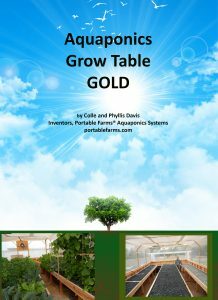 The Commercial Aquaponics GOLD ebook covers all of the information on sizing, marketing and being successful in aquaponics. Rough figures, excluding land cost, for an income of US$100,000 will be in the range of US$250,000 to US$320,000. The ROI, Return on Investment is approximately 3 to 5 years, this assumes you are hiring all of your labor. If you and your family are the labor then the ROI is closer to 2 years. I just bought your book…. AQUAPONICS GOLD© and I can’t quit reading it. Any ideas how I get away from the computer? 🙂 I mean it. As I begun my journey to build my first Aquaponics system several months ago….at the end of the day I always come back to your site. The book is great. The 17 secrets might look not much when you read it at first but I think those are some of the essential parts of understanding the aquaponic system. Thank you so much for your “legwork” and dedication for the past 40 plus years. Thank you for the kind words! 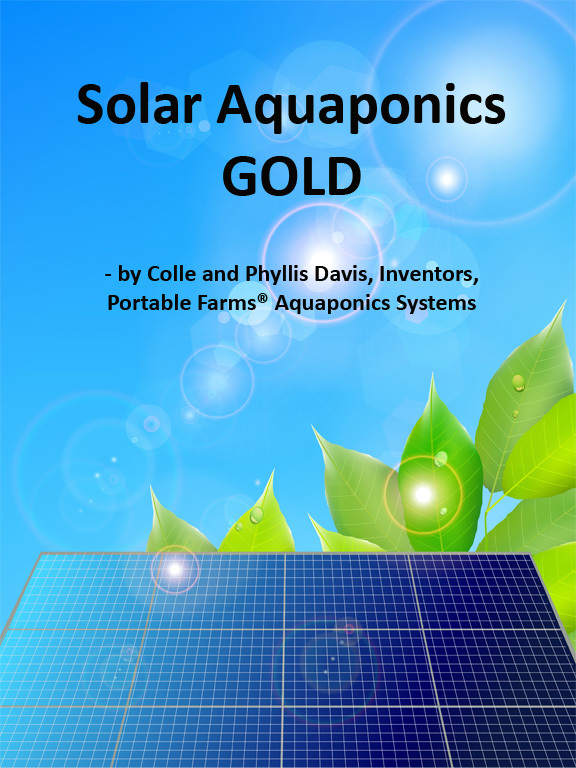 May I suggest you print out Aquaponics Gold and place it in a binder. Most of our Aquaponics University students do exactly that with the Aquaponics University Course so they can refer to the information easily. Congratulations to you on building your own aquaponics system. We call it getting your hands wet and it is THE best way to learn about the amazing technology first hand. 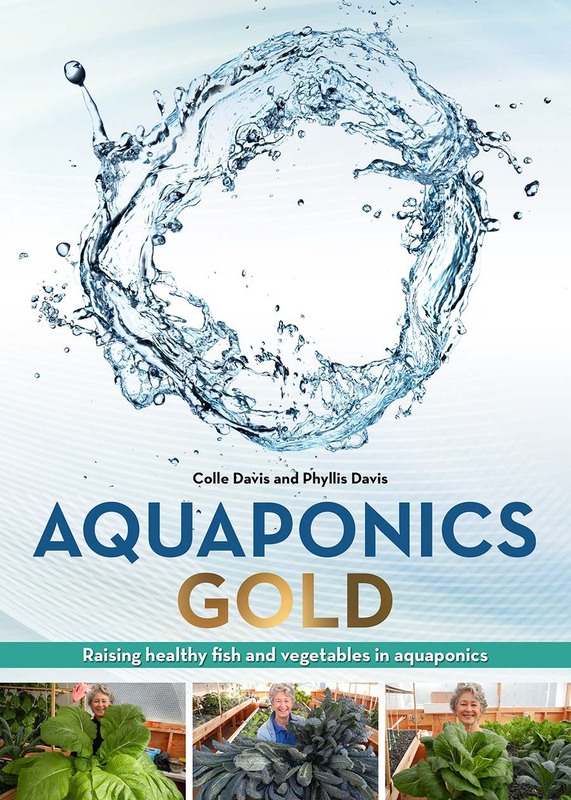 We also have two more books coming out, Commercial Aquaponics Gold and Backyard Aquaponics Gold. We’ll post the announcements on the website soon. Do you currently have a facility we can visit? If so, please advise so we may schedule a visit accordingly. Yes, the information on Tours is on the website. I’ve been researching aquaponics for awhile to start supplementing my retirement in the near future and came across your site on Pinterest. Congratulations on your Inventers award and was WOWED by your speech. did you ever have sent portable farm module to Indonesia? how much your costumers from Indonesia? Everywhere in the world is close today. We have students in 10 countries and yes, we have students in SE Asia. You will have to satisfactorily complete the Aquaponics University Portable Farms Aquaponics Systems Course© before we can ship you the PFAS Kit. The contents of the PFAS Kit is listed in the PRICE LIST available on every page, top right, of the website. Are there any PF customer testimonials that I could review? Is there any data available detailing the nutrient contents of various vegetables grown in the PF environment? We do not conduct studies for nutrient content in our plants. We supply them with 57 organic trace elements in our FF Mineral Rock Dust aside from the fish waste nutrients and the ‘taste’ of the food is excellent. I’m filipino, a technician working at Saudi Arabia. I’ve a 2 lots in the Philippines, one , sizes 1300 sq/meters, and the other one is 2400 sq./meters. I want to maximize my land with aquaponics to support my family (5 persons) and gainsome money . I just want to know much capital I need to corresponse to my lot area so that I can save. And where to I start ? Do your courses are online? I hope you could help me regarding this matter thank you. The area required to feed 5 people is only 12m2. This means that your plots can be utilized for commercial installations which usually start at approximately 1,000m2. A commercial installation of 1,000m2 including the land preparation, building, materials and the Portable Farms® Aquaponics Systems technology but NOT the land cost (you already have the land) will be approximately US$280,000 to US$300,000 and will feed 240 people. The ROI (Return on Investment) in most markets is 3 to 5 years. This means a payback of the original investment in 3 to 5 years. The income from a well run commercial PFAS installation is between US$80,000 and US$100,000 the first year and increases approximately 15 to 20% each year as the Operators and the installation become more efficient and the markets increase. We trust this information is of help and we look forward to having you as a student. The AU Course is an email correspondences course and we have students all over the world. worm items & I think some filter ideas that will be good for a “Clean system”! If you want to use a cobbled together system you need to follow some other system besides Portable Farms® Aquaponics Systems. There are literally millions of references on the Internet that will show you how to put together a homemade system. The Portable Farms® Aquaponics Systems for small and backyard installations is only available by taking the Aquaponics University Portable Farms Aquaponics Systems Course© where we teach you how to build a system in a climatically adapted structure and operate it successfully. I want to know that how much Investment I will have to do. Assume I have 10000 Sq.ft land. To better assess your project and offer answers that are timely and relevant to YOUR unique situation, please answer the following general questions related to your project and we’ll get back to you ASAP. Some of the questions may be redundant, answer them anyway. 1. What size project is your group planning to build? ¼ acre? 1 acre? Etc. 2. What state, country or territory is your project targeted for installation? 3. What is your projected time frame to begin your project? 90 days? One year? Etc. 4. What project of this size, in any arena, has your group accomplished in the recent past? In other words, can your group actually build this installation? 5. Is your funding in place? That means your group could pay cash for the entire installation TODAY. If not, do you have a target date for that available funding for the project? 6. Have you explored the marketing study for selling the food Portable Farms is capable of growing? This means, you have actually talked the chefs, food managers and buyers and have solid commitments from them to buy the production from your installation. After completing the above responses, please return them to me and I’ll send you the 5 Phases information. Hello: I would like to ask you if your system has been tested with Ornamental fish. Also if you have info about your system with big cat fish or Arapaima. Thanks in advance. We have had clients grow goldfish and koi very successfully. Catfish do extremely well in the Portable Farms® Aquaponics Systems. What would you suggest for an hobbiest in Canada (Montreal temperatures). Type of fish and food ? And mostly, how should it be cooled and heated ? if it is possible. The Portable Farms® Aquaponics Systems can be installed anywhere a climatically adapted structure is available. There are a growing number of PFAS installations in Canada. The fish we recommend is tilapia and most people feed them a commercial tilapia/catfish chow. They are herbivorous and can be trained to eat duckweed, lettuce, zucchini and other plant material, even coffee grounds. There are many ways to heat and cool the interior of the structure. One of the reason the Aquaponics University Portable Farms Aquaponics Systems Course© was developed was to insure success in virtually any climate by outlining the requirements of the plants and fish. Yes, it is possible and the PFAS owners in Canada are very happy with their installations. Am really very interesting with this aquaponic system. I have 0,5 hectare mineral land in Indonesia. What is the most desired of average water temperature for tilapia or gouramy fish? Could you please give us the guidance for land preparation,installation,etc? You need to spend more time on the website, the water temperature question is answered there. Use the SEARCH box, top right corner, to search for information on the site. For the Commercial aspect please send the answers to the 6 questions on the Commercial page and the Front page and we can get you started. Adjusted pH with vinegar to 7.2. Within 4 hours pH increases to 8.0 and then within 24 hours 9.0. Britta Filter lowered pH to 6.0. Within 4 hours at 7.5 and 24 hours 8.8. Reverse osmosis, ph 7 → 8.8 (24 hrs) Water that has been forced through a special membrane under pressure. It is a slow process that produces virtually pure water. This water requires remineralizing with essential elements before use in aquarium, but will be free of phosphates, nitrates and other nasty chemicals. Aquaponics Lab – 8.8 -9 in 24 hrs. Testing with and without gravel had no effect. We were wondering if you could maybe help us. Please let me know asap if you have any information on how to help us. Thank you! You teacher asked the same question. Use a product called pH Down to reduce the pH in your system. You way have to check it every day for a while. Do not use RO water. Use tap water, let it sit for a full day or put in Vitamin C 5mg per gallon to take out the chlorine. Without fish the pH will go up to the level in the water use and the above as evaporation pushes it up. That’s the best I can do for you because I have no idea how much water is in your system, what the turn over rate is and what plants you are using. I also live in Central New York. I have two questions: 1) I’m assuming that the water for the fish has to be heated in the winter. How much does that mass of warm 70 degree (+ or-) water contribute to the warming of the air in the greenhouse? 2) What is the rationale behind using a gravel type growing medium rather than the channels that are so common with commercially available systems? The fish tanks are insulated and so the water is only exposed to the gravel, not the air, in the space. The warm gravel does contribute to the temperature, but not as much as one would expect. The plants love the warm, nutrient laden water on their roots. We have had fantastic results with the gravel medium filled Grow Trays and our system is used to treat the water, the channels are not performing that function. We have an 1860s farmhouse in Central New York State… Building a climate controlled greenhouse for NY is a little cost prohibitive for us, but we have a completely unused basement that only houses our furnace and hot water heater. (approx 750sf) However, being an old farmhouse, the basement tends to be damp, has a dirt floor, and may prove challenging to keep “bug free”. Also, from time to time (once or twice a year), heavy enduring rains can result in a few inches of water in it as well. Is it conceivable that an aquaponics system could survive in such a space? It would be nice to finally find a use for the basement. Having been raised in Central New York, I understand exactly what you are facing. Two suggestions to implement, IF you want to use the space for a Portable Farms® Aquaponics Systems. 1) Put in a sump pump with a float valve in a sump hole. 2) Pour a concrete slab across the entire space to keep it cleaner.
. In the summer have a window fan SUCKING the air out of the basement. Good luck. You need to take the AU Course first. Hi do you have any reps in Australia? Not currently. We do have a system is place for local retail sales, BUT more resembles the selling of software with hardware, a bit like computers. We are publishing an article this week on ‘Distributorship for Portable Farms®’ that will be helpful. It is a serious investment and requires a construction company either as the primary or as a partner in the venture. Stay tuned. I live in southeastern Georgia. We rarely drop below freezing. Is it necessary to have a greenhouse for an aquaponics system in the southern regions of the U.S.? You need a climatically adapted structure everywhere and in Georgia it is mostly to keep the rain off and the bugs out. Currently there are no publicly accessible PFAS installations in the UK. There are several projects ‘in the works’ as they say, but none open to the public yet. When the first ones are available, we will announce them in our newsletter and on our website and they will become rock star attractions because we receive so much traffic from the UK to our websites. I am currently a year 12 student at Brighton Secondary School and planning to base my Research Project within Brighton Primary School’s Produce Garden. I have been given the opportunity to manage an aquaculture system for Brighton Primary School’s Produce Garden. The project will involve researching, designing and organising a commercial grade aquaculture/aquaponic system. This project is for students to be educated in the science and business of cultivating marine or freshwater food, which may include varieties of fish or shellfish. This is not only an important part of my schooling, but also a valuable project within BPS. What type of aquaponic system design would you think would best suit an indoor area that young students could observe or be involved with, and why?? There are literally millions of pages of information on the Internet about aquaculture and aquaponics. You will have to choose the system best suited for your specific needs and outcomes. A commercial Portable Farms Aquaponics System is not a teaching tool, it is a high intensity food production facility. Start small with fish tanks, grow lights and grow beds and see how the systems work in your indoor facility. I trust this information is of help to you in some way. First, i’m not speak english, i’m from Colombia, and i admire all what you can make with aquaponics system, i’m really surprised with the food’s quality, beauty and scale. I would like to take aquaponics practice. Pitifully in this country i don’t find out some informatión or way to start it, there’s not so much information. thanks for attention and sorry for my limited English. Thank you for your nice note. As long as you can read and write English you will do fine in the Aquaponics University Course. My Spanish is not so good either unless I have a couple of beers. Then take the Aquaponics University Portable Farms Aquaponics Systems Course© and you’ll be ready anywhere. Do I have really have to give my information just to get the pricelist? Any other way of getting it? The request for a Price List is a business transaction. You fill in the form, we send you the link, put you on our mailing list and you can immediately unsubscribe when your receive the first of the really well done newsletters. Your website has the same arrangement so what about our request bothers you? It is the way online business is done. Every page has a FREE PRICE LIST sign up. Right hand column, second box. Fill in your email address and first name, click SUBMIT and VOILA, up pops the price list. The 5 Phases request also has an email request form you can use, please do so. Hello my name is Andrew, I am a college student and was looking at you’re product and I work for a restaurant and they wanted me to build a aquaponics system for them, and eventually grow to selling capacity if we were do that would we be allowed since you have a patent pending? The patented system does not prevent you from selling the food. It prevents you from duplicating or teaching our technology to others. Which system do you plan to build. The Aquaponics University Portable Farms Aquaponics Systems Course© is the best place to start the process. Nothing is chemical free. This system is probably not for you. It uses PVC pipes, plastic fish tanks and plastic liner so you could not eat the output anyway. 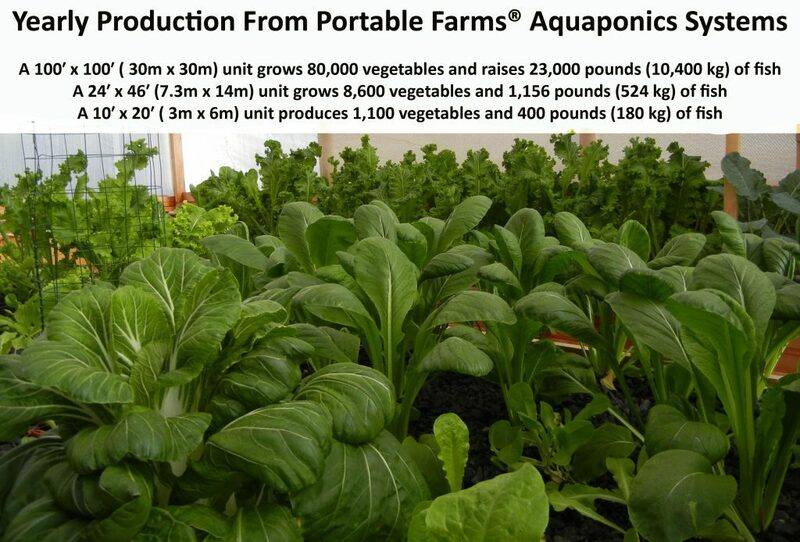 The figures on output are on the website and to buy two will require you taking the Aquaponics University Portable Farms Aquaponics Systems Course©. I have a green house measuring 500 sq.meters and would like to try aquaponics in about 250 sq. meters. After having tried it out and if successful, I would like to expand it in the entire 500 sq. meter polyhouse. I would appreciate your giving me an idea of what I can begin with and how much investment I would have to make in the first phase (250 sq. meters) if I bought the entire system from you. Thank you for your inquiry. I have sent you the 5-Phases of Commercial Growing .pdf in a separate email that will be extremely helpful in planning your project. We do not sell entire systems, only the technology. You will be well served to take the Aquaponics University Course also. Hello, I suppose salmon is out of the question for me, but I was wondering if you could grow another type of fish other than salmon, tilapia and catfish, if so what kinds of fish would you suggest? The fish that are the easiest and least expensive to raise are freshwater, warm water herbivores. Carnivores require animal protein to grow well. Some fish food formulations are now available for them, but we are not familiar with their cost or effectiveness. Perch is a growing favorite, but require animal protein which is mostly in the form of ocean fish ground up and powered, contributing to over harvesting of the oceans. Tilapia are very easy to raise, are readily available, taste great and have a standing market. This may not be what you wanted to hear if your favorite fish was not mentioned, but that is the state of the industry today. I am planing to go Aquaponics way from conventional farming. Before I plan to move in this direction I wanted to know what is the ratio of land utilization comparing conventional farming vs Aquaponics. I have 2 acres of land which i want to use for this. 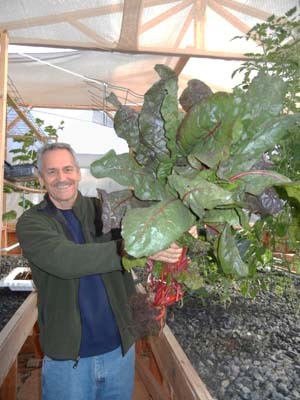 It is very hard to move from conventional farming to aquaponics because they are so different. Interestingly, we have never, knowingly, sold a PFAS Unit to a farmer. They are not interested in the technology. The ratio of utilization of land is not an accurate way to compare them. Very few farming methods can yield nearly 80,000 lbs (35,000 kilos) of tomatoes per year from 10,000 sq ft (1,000m2). You do not need much land, or much water, or much electrical power, only someone to plant and harvest the vegetables and feed and harvest the fish. your welcome to have a look at my page in the forum, I’m sure if you have a working system alot of people there will be intrested! Thank you for your inquiry into the feasibility of salmon aquaponics. For backyard or small installation, as another person in the forum pointed out, if there is no profit it, then it is only a hobby. In the case of salmon aquaponics it is not financially viable and will simply be a fun and frustrating hobby. For commercial operations the key is to figure out an economic way to COOL the water. In northern latitudes in is MUCH EASIER to cool water than is hot climates. When we receive inquiries from locations such as Dubai or Nigeria or Haiti we carefully point out that heating the water and the space is almost never a issue, it is the cooling that requires the big bucks. We express a similar sentiment for people in Northern Canada, Finland and Alaska that they need to have a relatively inexpensive source of energy to insure enough heat if they are using tilapia or catfish. In the cool climates retaining the heat in the water is easier because they can use insulated tanks. When we are approached by a company serious about a commercial salmon aquaponics installation in a cool climate we show them exactly what is involved and how much it will cost. These installations start in the US$250,000 and up range. There is not enough money in the backyard or hobby arena of salmon aquaponics for anyone to make a profit and Portable Farms LTD is in business to make money. I trust this addresses what you were asking of us.